It was two years ago – more than a year before the referendum – that I pointed out on this blog that it was wrong to assert that major nations such as the USA, India, China, Japan and Australia had no trade agreements with the EU. The piece was intended to counter the ill-informed and clearly incorrect propaganda from the likes of Global Britain, and its director Richard Tice. These people were asserting that the WTO option was an acceptable Brexit solution, on the basis that other major countries countries traded under WTO rules. As to China, I pointed out that, although the EU did not have a [free] trade agreement with this country, it did in fact have multiple lesser agreements - 65 over term. They included 13 bilateral agreements, ranging from trade and economic co-operation to customs co-operation. Additionally, I wrote, China tends to foster multilateral relations, working actively through G20, where it agreed with the EU the 2020 Strategic Agenda for Cooperation. Reinforced by 60 high level and senior officials dialogues on topics including industrial policy, education, customs, social affairs, nuclear energy and consumer protection, this makes for powerful relationships which do not show up on the WTO books. I repeated the point about trade agreements and the WTO many times and followed through a year later in respect of the United States. Using official but easily accessible data, I demonstrated that there were many current EU-US "trade deals", of which at least 20 were bilateral. That latter figure was later used by Ivan Rogers, who quite obviously got it from this blog. In July last year, in yet another piece covering the issues so blatantly ignored by the mass media and the pundits, I observed that so many other countries had deals with the EU that it was difficult to identify countries which did trade solely under WTO rules – there were so few of them. One cannot even cite North Korea, ranking 182 as an EU trading partner, I wrote, as this is not a WTO member. Altogether, I noted, the EU had 880 bilateral agreements with its trading partners, and there was "no example of a developed nation trading with the EU solely by reference to WTO rules". No other major player trades with the EU on pure WTO-only terms. It is not true that the Americans, Australians, Canadians, Israelis or Swiss do. They strike preferential trade deals where they can, but they also strike more minor equivalence agreements: financial services equivalence agreements, veterinary equivalence agreements, mutual conformity of assessment agreements. The EU has mutual conformity of assessment agreements with the US, Canada, Israel, Switzerland, Australia and New Zealand, and more. What everyone needs to appreciate is that we do not need a trade deal to trade. We trade across the globe with countries we do not have a trade deal with. Go into any shop, pick up an item and it will probably say, "Made in China", a country with whom we do not have a trade deal. Likewise with the US. Research commissioned by Open Britain, which campaigns for continued ties with Europe in the aftermath of Brexit, found that no members of the G20 group of richer nations currently interact with the EU without some sort of trade arrangement. Well, you don't say! Two years late, long after this issue should have been put to bed, they are finally waking up to the situation. If nothing else, we see the classic legacy media tendency to that nothing exists until they have "discovered" themselves. The "research" itself, from Open Britain, is pretty shoddy work. Even with the help of the House of Commons library, they obviously don't know where to look for their information. Missing from their narrative is any reference to that major repository of information – the EU's treaty database. As a result, their country listings are thin gruel. The entry for the United States offers only three "agreements", as opposed to the 20 listed in the database. For China, they note only that "the EU has granted China equivalence in relation to certain aspects of financial services". This is pretty pathetic stuff, and barely enough to put the likes of John Mills in his place – another of those wearisome individuals who have convinced themselves that the WTO option has some mileage, despite evidence to the contrary. The sad thing is that the information is not at all difficult to find if you know where to look, as here, where you can see no leas that 67 agreements between the EU and China listed. Of particular relevance is the 2004 Agreement "on cooperation and mutual administrative assistance in customs matters" – a full-blown treaty which has paved the way for China and the EU member states to work closely together on easing the flow of goods through customs (making it too easy, some would aver). The granddaddy of them all is the 1985 Agreement on trade and economic cooperation. This forged relations between the parties, when they pledged to "promote and intensify trade" between them and to "encourage the steady expansion of economic cooperation". The deal set up the infrastructure which has led to the explosion of Chinese goods coming to Europe. It is the case, therefore, that none of these nations rely on the WTO option. For us to enjoy the same trading relationships with the EU as are enjoyed by the US and China, we would have to see replicated exactly the same complex combinations of unilateralism, bilateralism and multilateralism. Complex, they are and poorly understood, but that does not mean these arrangements do not exist. They do. Some of the earlier background is set out in Monograph No 1, published in July last year. This explores the WTO option, building on the original work in Flexcit. But it would seem that media and political pundits would rather poke their eyes out with sharpened knitting needles that read something useful. And when they do, they would rather steal it than admit its source. The lack of sensible debate, therefore, means that we've had to wait until this weekend for a report from the Foreign Affairs Committee on the "implications of 'no deal'" in the Article 50 negotiations. But what a lacklustre and shabby thing it is. It tells us a lot less that you could have read on this blog over term and repeats some of the more egregious errors on the EU. Crucially, it then misses the point on the day-one effects of adopting the WTO option, in causing a logjam at the ports. Back in the day, we warned Dominic Cummings about the hazards of the WTO option, only for him and Vote Leave completely to ignore the warnings. Now it takes the "prestige" of a select committee to get its chairman, Crispin Blunt, onto the Marr show. That then got the legacy media crawling round the issue, but only because it was couched in "biff-bam" terms, where the Department for Exit was accused of not planning for a "no deal" scenario. The conflict gave the necessary dynamics for legacy media coverage, bringing Davis Davis into the fray to deny the charge. Amazingly, he asserted to the gullible Marr that his department was doing the "contingency planning" to make sure that the WTO option "is not harmful". The point sailed over Marr's head, even though it was way beyond stupidity. 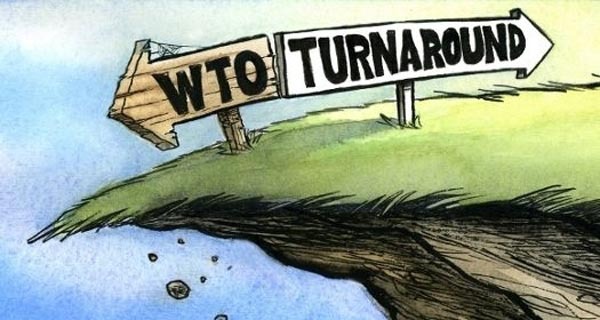 Anyone who sees the WTO option as anything other than an unmitigated disaster, to be avoided at all costs, is not safe to be let out on their own. In contrast to the Brexit minister's complacency, though, the Treasury is arguing that reliance on the WTO option would cause a "major economic shock". Crashing out of the EU without a trade deal is the "alternative to membership with the most negative long-term impact" on the economy, it warns. That got the Guardian squeaking that no deal "is not an option", while the Mail tells us that warnings about crashing out of the EU without an agreed deal "cannot be ignored". All of a sudden, we're getting into the detail of what this blog has been asserting for years. Too late they all are, having stood back from the substantive issues, when years ago they should have been at the centre of the debate. That they are only starting to talk about what really matters represents the most profound dereliction of the politico-media nexus – no more or less than serial incompetence. Debate should not be optional entertainment on such matters. Ill-informed politicians make stupid mistakes. Information is the currency of democracy, and we've been short-changed.